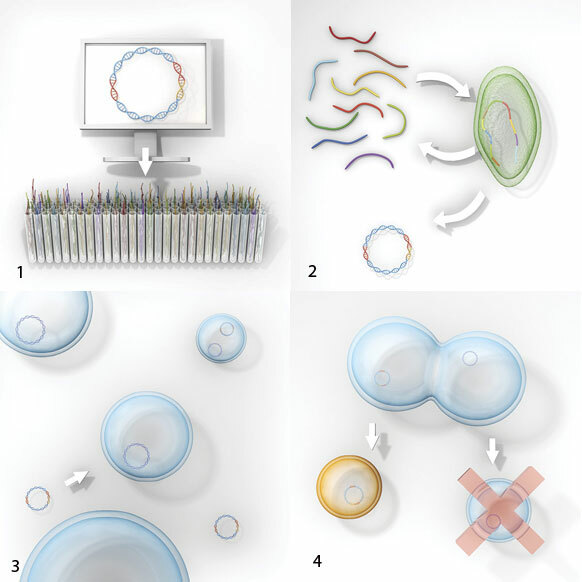 1: Bacterial genomes take the form of rings of DNA. An artificial genome is designed on a computer, including a sequence that “watermarks” the genome (red arc) and one that confers resistance to antibiotics (yellow arc). The genome is then synthesized as 1,078 overlapping DNA fragments. 2: Yeast cells stitch together 10 sequential fragments at a time. The longer strands that are produced are in turn stitched together by other yeast cells, and the process is repeated until copies of the whole genome are assembled. 3: The synthetic genomes are added to a colony of bacteria. Some of the bacterial cells entering the process of division absorb the synthetic genomes alongside their own. 4: When the bacterial cells divide, each daughter inherits one genome. An antibiotic is used to kill cells with the natural genome, leaving a colony of bacteria with the synthetic genome. The bacteria growing on stacks of petri dishes in Daniel Gibson’s lab are the first living creatures with a completely artificial genome. The microbes’ entire collection of genes was edited on a computer and assembled by machines that create genetic fragments from chemicals and by helper cells that pieced those fragments together. Gibson hopes that being able to design and create entire genomes, instead of just short lengths of DNA, will dramatically speed up the process of engineering microbes that can carry out tasks such as efficiently producing biofuels or vaccines. Until last year, biologists hadn’t been able to make large enough pieces of DNA to create an entire genome; though living cells routinely make long stretches of DNA, a DNA synthesis machine can’t do the same. In May, ­Gibson and his colleagues at the J. Craig Venter Institute announced their solution to this problem. Gibson used yeast cells to stitch together thousands of fragments of DNA made by a machine, pooled the longer pieces, and repeated the process until the genome was complete. Next he inserted the genome into bacterial cells that were about to divide and grew the bacteria in a medium hostile to all cells except the ones harboring the synthetic genome. “When we began in 2004,” he says, “assembling a complete bacterial genome didn’t seem like an easy thing to do”—even though the Venter Institute researchers started with one of the smallest bacterial genomes that have been sequenced, that of a mycoplasma. After finally overcoming the technical hurdles involved, Gibson says, creating the synthetic cell itself was exciting but almost anticlimactic. Going from computer screen to bacterial colony now seems easy. Gibson has also developed a faster, yeast-free way to assemble large pieces of DNA in a bottle. His colleagues are using these methods to rapidly synthesize the viral DNA needed to speed up the production of influenza vaccines. The nonprofit Venter Institute is working with Synthetic Genomics, a company that commercializes work done at the institute, to develop products. The creation of the synthetic cell is part of an effort to design a “minimal cell” containing only the most basic genome required for life. Gibson and his colleagues at the Venter Institute believe that synthetic biologists could use this minimal cell as the basis for cells that efficiently produce biofuels, drugs, and other industrial products. And it won't become just another abberation. "...When the bacterial cells divide, each daughter inherits one genome. An antibiotic is used to kill cells with the natural genome, leaving a colony of bacteria with the synthetic genome..."
Sounds like treaty-breaking bioweapons research to me. "one that confers resistance to antibiotics"
"An antibiotic is used to kill cells with the natural genome"
I think that this technique of using industrially antibiotics to kill bacteria, will lead to antibiotic resistant bacteria mixed with the vaccines.... I think they should change strategy for selecting the bacteria we want. I can't think of any technique, but I'm pretty sure there is one. Using antibiotic resistance as a marker is an extremely common technique in biology, and has been used for decades. It is done carefully using antibiotics that are not usually used for human therapeutic purposes due to undesirable side effects. Many of these organisms have been used in industrial processes already. Antibiotic resistance is a problem, but it is caused by people not taking their antibiotics properly, or by using one or two pills that were prescribed to someone else because they feel sick.